"This is a fresh salad my husband and I eat a lot during the warm summer days. Garnish with peanuts or pine nuts." Whisk mint, vinegar, water, rose water, salt, and pepper together in a bowl until dressing is smooth. 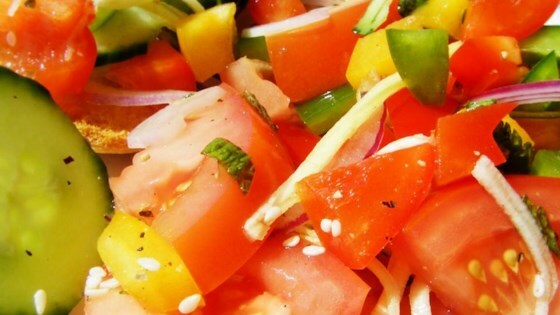 Mix tomatoes, onion, cucumber, green bell pepper, and sun-dried tomatoes together in a bowl. Pour dressing over tomato mixture and stir to coat.